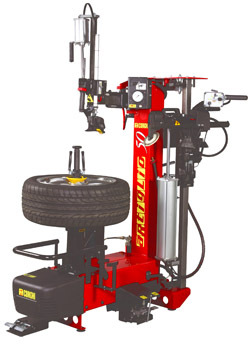 Representing over 50 years of tire changer evolution, the Corghi ARTIGLIO 50 is the latest in tire changer technology. The innovative design of the 50 allows it to easily handle the oughest tire and wheel combinations on the market today. • Sturdy pneumatic locking swing-arm design enables the machine to be close to the wall. • Powerful two-speed transmission for both precision and speed. Exclusive slowstart first revolution when fast speed is engaged allows the tire to slip into the drop-center, eliminating the binding that tears beads. • Precision bead breaker disk gently loosens both beads. • An all-new bead lifter eliminates the need for a tire bar, reducing operator risk and torn beads - another Corghi exclusive. • Center cone clamping with plastic protector means no metal touches the face of the rim at any time. • Handles tires 12” to 30”, including UHP, run-flat and low-profile tires PAX capable with optional adaptors.